We’re still gathering ourselves up after being away – still slapping on the moisturiser to deal with the after-effects of the sun. Yes! Poppy has returned from apartment-dwelling with Anna in Belfast. She doesn’t do Easyjet – prefers travelling as a paws passenger on the Stena HSS to Stranraer. Meanwhile I’m still pondering the preaching and sermon-surfing issues raised by the Independent on Saturday – was there ever a skill or a discipline so widely misunderstood? I’m a believer that good communication tends to happen when there are time boundaries – broadcasting makes you that way. So I write about 400-500 words – certainly no more. Every word written out – and then I don’t read them. Strange. 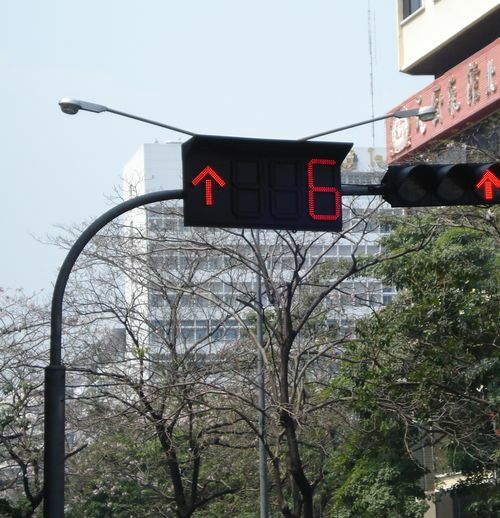 Meanwhile I just happened to find this handy sermon-timer doing duty at traffic lights in Bangkok. It counts steadily down in green until your time is up. Then it counts in red. Every church should have one?